South Street Seaport – When is a change just more of the same ? The historic Tin and New Market sites are the only remaining components of the original Fulton Fish Market. Their setting along the East River right below the Brooklyn Bridge, and their relationship to so much of New York’s waterfront history make them very valuable and irreplaceable public assets. 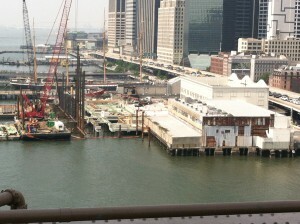 – Howard Hugh Corp. (HHC) – one of many real-estate developers with eyes on New York’s waterfront; currently working as EDC’s private partner to gain control over and effectively privatize the New Market site. – The city undertakes and then proceeds to ignore studies dating back to at least 2006 which indicate that the Tin & New Market piling infrastructures need repair. 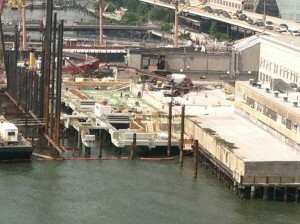 – In 2014, extensive, high-impact pile driving begins directly adjacent to the Tin & New Market platforms to create a new pier for the new Pier 17 mall . The city does not revisit its completely outdated environmental assessment, and disregards its own studies on the known, vulnerable Tin and New Market infrastructure. – EDC declares an ‘emergency’ in May 2015 for failing pier infrastructure on the Tin and New Market sites, saying immediate demolition is required to ‘protect’ the public from dangerous conditions. The city’s Negative Declaration of Aug. 2012 states that there would be no “significant adverse impacts” on “Historic andCultural Resources”. Though the document notes that a Construction Protection Plan would be created, no protections were put in place for the historic Tin and New Market sites. After the EDC makes its emergency demolition plans public, the HHC construction company puts up some shoring supports at the rear of the buildings. – EDC and HHC strongly deny that the Pier 17 pile driving as well as development plans for the New Market site have anything to do with the ‘emergency’. 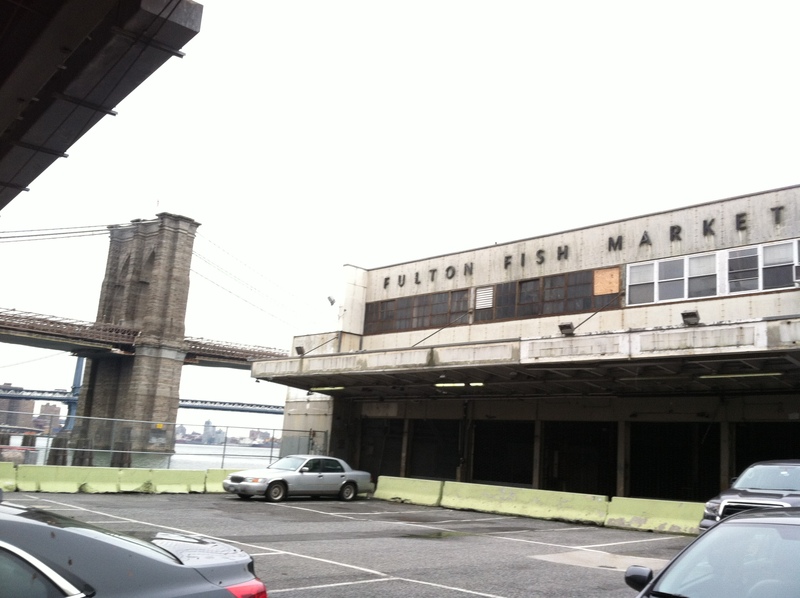 – Several elected officials and Seaport preservation advocates push for proper procedures to be followed before any demolition proceeds. EDC regroups and indicates that it will first seek all necessary permits to demolish only the rear ‘cooler’ areas, after which it will reevaluate if further demolition is needed.
? A new perspective for the EDC – or just the same semi-private mode of operation marketed as a public-private partnership ? Maria Torres-Springer, Commissioner of the Dept. of Small Business Services (see above) – the city’s landlord for the Tin and New Market sites as they continue their deterioration through neglect – has recently been appointed by Mayor de Blasio to head the Economic Development Corp., the agency intent on giving away these public assets for private real-estate development.